Founded in 1929, Scoggin-Dickey Parts Center, SDPC, has worked hard to build a reputation centered on service and customer satisfaction. 4th generation family owned and operated, SDPC is a long and lasting tradition in the automotive industry. 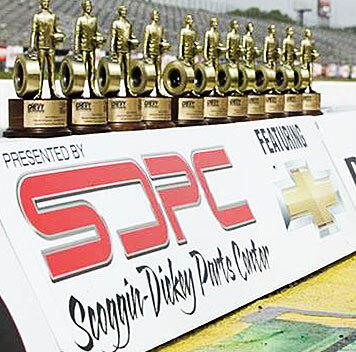 SDPC is the first choice for performance crate engines at the most competitive prices in the world. If you are looking for factory GM Parts, then call the professionals at Scoggin Dickey. More customers from around the globe purchase their GM Parts direct from SDPC, one of the largest wholesalers in the world. Ask any of our satisfied customers from around the globe and you'll find out why Scoggin-Dickey Parts Center is the first choice for parts in the automotive industry. Whatever your parts needs are – from antifreeze to complete engines – you now have more reasons than ever to trust SDPC to deliver the parts you need. In addition to the same dependable service and incredible inventory that Scoggin-Dickey is known for, you have access to one of the largest GM Parts inventories in the USA, over 2-Million cubic feet of warehouse space, over 300,000 part numbers, new GM replacement engines, Chevrolet Performance Crate Engines, GM Accessories, GM factory sheet metal and all of your favorite performance brands – Edelbrock, MSD, Holley, LSX, COPO, Tech AFX, Kooks Exhaust, ARP, Billet Specialties, Moroso, Magnaflow, N-Motion, Federal Mogul, Callies and more all under one roof! Wholesale pricing and the best inventory in the USA is immediately accessible to you. Call one of our professional parts experts today and let us show you why so many rely on Scoggin-Dickey Parts Center for all of their automotive needs. Serving the world since 1929.